He was hot, spooky and prancey. Raring to go, a million miles an hour and not willing to slow down and listen to me. Common things we see every day were terrifying, the windmill was going to eat him. There were a couple of times I was actually a bit worried. 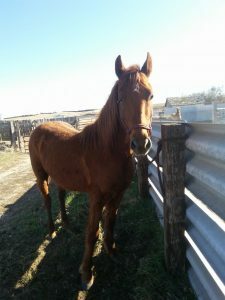 My nearly twenty year old, broke to death gelding had a little melt down when asked to pony Rusty. He’s ponyed dozens of colts in his time, maybe that’s why he was so mad about this. He’s reached a point in his life, ok he may have always been at that point, where he has strong opinions about what he does and does not want to do. He did not want to do this. All in all it went well though. Nobody died. 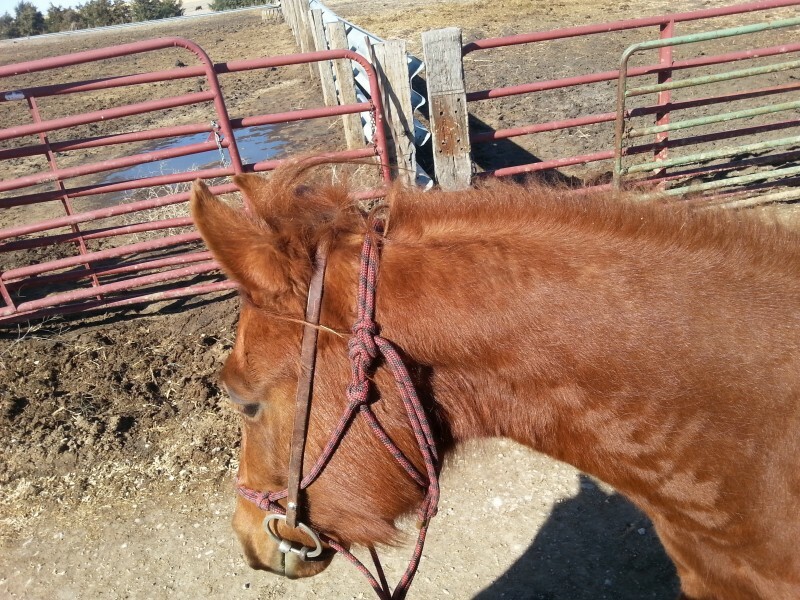 I put on a saddle and Coyotes big, cow eating bridle, fortunately. 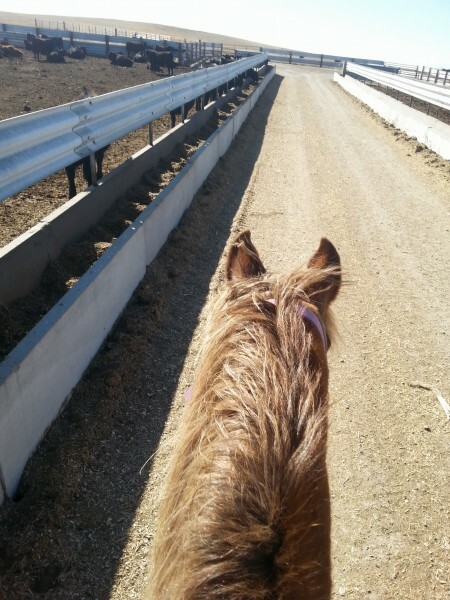 We went up the scary lane between the pens in the feedlot. Then through the pasture to check out the baby calves. 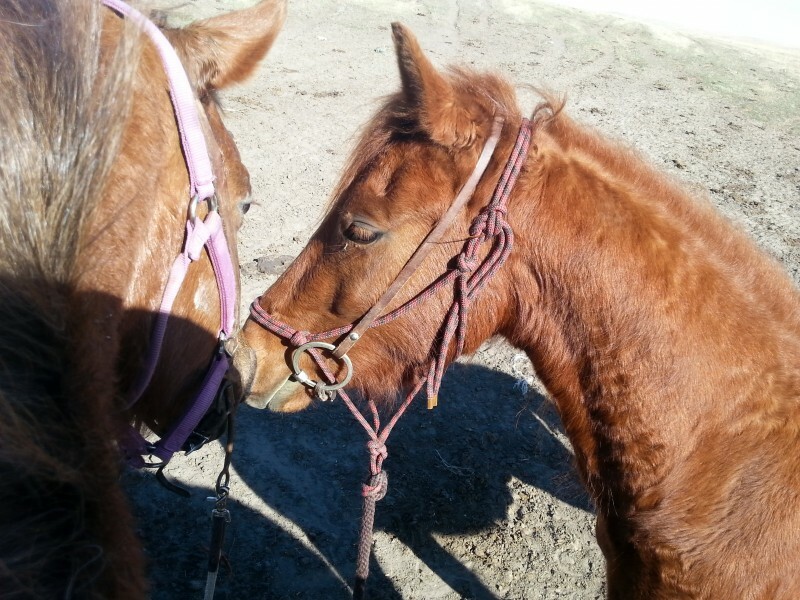 He, Rusty, followed one around, neck all arched pretty sniffing like crazy. Then its mom came and we had to leave. Out the gate between the trees that always terrifies Coyote. 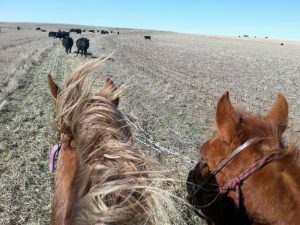 Around the corn stalks through more cows, then back into the pasture. 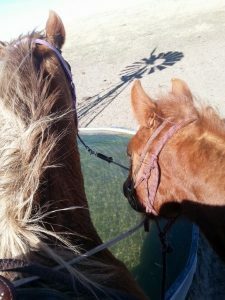 Past the horse eating windmill, splashed around in the pond. He was hesitant at first, hung back then leaped into the water. But no less upset by it than Coyote. Up and down some hills and jumped up and down some banks then back through the corrals and home. With a brief visit with my husband at a tractor. Rusty and Coyote grazed happily along side the running tractor and squeezed between the farm implements as we talked. That wasn’t scary at all, not like a windmill. two, what do you call it, double swirl horses. What fun! Must be nice to have a baby to work with again.